A whole lot was going on in the world. The Oklahoma City bombing, Somalia, Bosnian War, O.J. Simpson… among the crazy things. Toy Story, Batman Forever, Golden Eye, Apollo 13, Braveheart, Die Hard with a Vengeance were some of the big movies in the theaters. Deep Space Nine was in its third season and Star Trek: Voyager was making its debut. Space Shuttle Atlantis docked with the Russian Space Station Mir for the first time, marking a significant beginning to international space operations. And I was drawing and building models. I have had a long time interest and love for the space program and science fiction. And through my teens, that interest greatly influenced the models I bought at the time. (Nothing but starships and rockets for me!) Apollo 13 was in theaters and there were a lot of materials related to the mission and production of the film available. So it really wasn’t a surprise that Monogram’s 1/144 scale Saturn V rocket kit was calling my name. 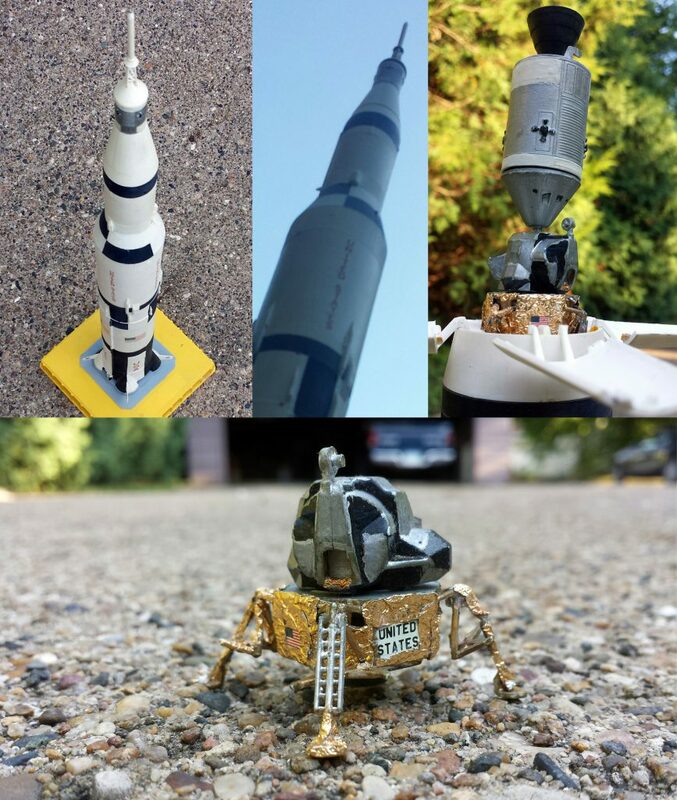 The kit was sort of a simple demonstration model re-issued from the late 60’s that looks to be based on early versions and not designs used on actual flights. Each of the stages locked together and had removable command and lunar modules. Details were lacking and I knew I wanted to do more than just build it straight from the box. My reference resources were kind of limited at the time (remember, pre-Google) and my skills were still developing. In the end, all I could do was try to paint it as accurately as I could. However, I did make a point to attempt to make the lunar module look more impressive. With limited tools, I cut out and added the forward entrance hatch. The kit was designed to allow the landing gear to be positioned from its folded launch configuration to a fully deployed position. However, due the scale and other factors, the supports were molded in their stowed configuration on the main gear struts. I thought that looked bad so I carefully cut them away from the main struts and bent them so they looked like they were sort of deployed. I had also somehow got it so that it could still all fold up to sit inside the third stage. I really wanted to add the RCS thruster assemblies and other antennas. But I just didn’t have the know-how to make it happen at that scale at the time. Finally, I scrounged up some gold foil from some candy to replicate the thermal insulation that covered the descent stage. The final result wasn’t perfect, but I was happy with what I had achieved. The final product was a joy to look at and, in a way, provided a means to get up close and personal with that amazing hardware. And believe me, it was ‘launched’ on many missions and even served as a classroom teaching aid for a couple years before it was retired to a box in storage. Looking at it today I know I could now build a much better replica. Yet at the same time I still kind of feel proud in what I achieved with that model 21 years ago. Its crudeness is overshadowed by the knowledge that I pushed my skills and crafted it with the best of what I had available in terms of reference, tools and materials. When you think of it, on a real small scale, what was achieved on this build is not too unlike the achievements of the real Apollo program- philosophically speaking, that is. By today’s standards, it was rather crude and primitive. But at the time, it was cutting edge and pushed the best of the best to do better and go further. We have the skills, knowledge and technology to fly circles around that program yet we we’re still kind of at a “yeah, someday” sort of thinking. Well, I shouldn’t get too righteous. I’ve been riding the “yeah, someday” train for some time. Time to take a cue from history and get to making a body of work worthy of history. Project Apollo will always be a shining example of what can be accomplished when we set aside all the frivolous and stupid stuff (like writing this article) and push ourselves to keep taking that next step.